Ganesha is the formless Divinity - encapsulated in a magnificent form, for the benefit of the devotee. Though Ganesha is worshiped as the elephant-headed God, the form (swaroop) is just to bring out the formless (parabrahma roopa). He is, ‘Ajam Nirvikalpam Niraakaaramekam.' This means Ganesha is Ajam (unborn), he is Nirvikalpa (attributeless), he is Niraakaar (formless) and he symbolizes the consciousness which is omnipresent. Parvati is symbolic of festive energy. Her becoming dirty signifies that celebration can easily become Rajasik, or feverish and can take you away from your center. Dirt is symbolic of ignorance, and Shiva is symbolic of the Supreme Innocence, Peace and Knowledge. Elephants don't walk around obstacles, neither are they stopped by them. They just remove them and walk ahead – signifying effortlessness. Ganesha's big belly represents generosity and total acceptance. Ganesha's upraised hand, depicting protection, means, 'Fear not, I am with you', and his lowered hand, palm facing outwards means endless giving as well as an invitation to bow down, this is symbolic of the fact that we will all dissolve into earth one day. 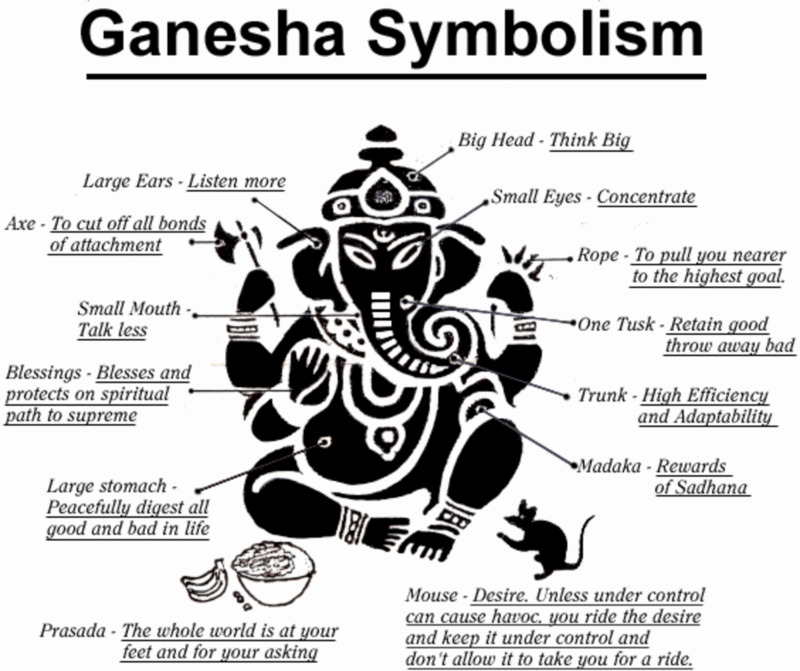 Ganesha also has a single tusk which signifies one-pointedness. Even the implements Ganesha wields are symbolic. He carries in his hands, the ‘Ankusa’ (signifying awakening) and the ‘Paasa’ (signifying control). With awakening, a lot of energy is released, which without proper control, can go haywire.